1.1 This Agreement sets forth the universal terms and conditions, together with any documents referred to herein (“Terms”), on which we supply our products/services and they also govern your use of our website (“Website”). 1.2 In these Terms, “we/us/our” shall mean Kalm Pilates and “you/your” shall mean you as the customer or visitor to our Website. 1.4 We recommend that you please read these Terms before using our Website as they affect your legal rights and liabilities, and furthermore, the basis upon which we will supply our Pilates Programs to you and our products (“Programs”), whether you continue to browse or use the Website or purchase our Programs. By using the Website and your acceptance of this, you confirm you have read, accept and acknowledge these Terms and agree to adhere to these at all times. We recommend that you print a copy of these Terms or save a version to your computer for future reference. 1.5 Please read these Terms carefully before you submit your Order to us. These Terms tell you who we are, how we will provide any products to you, how you and we may change or end the contract, what to do if there is a problem and other important information. If you think that there is a mistake in these Terms please contact us to discuss. 1.6 These Terms, and any contract formed between you and us, shall be in the English language. 1.7 All charges relating to the purchase of Programs on our Website are set out on our Website and will be stated inclusive of VAT (where applicable). 1.8 Where you communicate of a company or organisation, you agree that you have authority on its behalf to proceed with us. 1.9 We may from time to time changes to these Terms and any policies and agreements which are incorporated herein and such changes shall be effective immediately upon posting to this Website. Your use of this Website after such changes or the purchase of our Programs, shall constitute your acceptance. If you decide to purchase our Programs via this Website, you agree that our Programs are not intended in any way to diagnose, treat or prevent any medical condition and we therefore recommend that you seek medical advice from your medical practitioner before proceeding, if you have any concerns regarding your health. Our Programs do not amount to medical advice and simply constitute our recommendations. 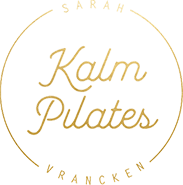 2.1 We are Kalm HBF Ltd trading as Kalm Pilates, a company registered in England and Wales. Our company registration number is 10458341 and our registered office is at PO Box 257, Worcester Park, England, KT49DY. 2.3 If we have to contact you we will do so by email. 3.3 By using our Website, you consent to such processing and you warrant that all data provided by you is accurate. 3.4 You agree and we agree to comply with the requirements of GDPR. 4.1 Our Website will guide you through the ordering process. Before submitting your Order you will be given the opportunity to review and amend it. Please ensure that you have checked your Order carefully before submitting it to us. 4.2 Orders shall be accepted at our sole discretion. Our acceptance of your Order will take place when you place an order on our Website and we confirm it, at which point a contract will come into existence between you and us (“Order”). 4.3 If we are unable to accept your Order, we will inform you of this and will not charge you. This might be because of unexpected limits on our resources which we could not reasonably plan for, because we have identified an error in the price or description of the Programme etc. 4.4 If we accept your Order, we shall acknowledge this and then upon payment, we will confirm what Programs you have agreed to buy and you will then be able to access the program. 4.5 By placing an Order with us, you agree that you are over the age of 18 years old and in good health. You will not proceed with your purchase if you cannot make these representations to us. 5.1 We cannot guarantee that our Programs will always be available. 5.2 We make all reasonable efforts to ensure that all prices shown on our Website are correct at the time of going online. We reserve the right to change prices and to add, alter, or remove special offers from time to time and as necessary. 5.3 All prices on our Website include VAT. If the VAT rate changes between your Order being placed and us taking payment, the amount of VAT payable will be automatically adjusted when taking payment. 5.4 The price payable for access to the Programs shall be the prices shown on our Website and you agree to make the payment to us as indicated in the ordering process. 5.5 Our Programs are available on an “as is” and “as available” basis. You therefore use the Programs at your own risk. 6.2 From time to time, we may make changes to our Programs to ensure that we continue to offer a good service and we will update these via this Website. 7.1 If you have changed your mind about the Program, you may be able to get a refund if you contact us within 14 days of placement of your Order but you must formally notify us of your intention either by emailing us or writing to us at [email protected] However, as our Programs comprise of digital content which you agreed to when placing your Order, you will not have a right to change your mind and you waive any such right to do so. 7.2 This does not affect any consumer rights you may have in the event that our Programs are faulty in any way. Please contact us at [email protected] as soon as reasonably possible to inform us of the fault, damage or error. (b) you do not, within a reasonable time of us asking for it, provide us with information that is necessary for us to provide the Programs. 7.4 We reserve the right to withdraw the Programs. We may write to you to let you know that we are going to stop providing these and we will let you know at least 7 days in advance if this is necessary, and will refund any sums you have paid in advance for any Programs which will not be provided and/or suggest replacements. 8.1 You confirm to us that you are over the age of 18 years old and you are able to participate in our Programs. 8.2 You acknowledge and confirm that you are in good mental and physical health and are unaware of any reason why you are unsuited to taking part in any of the Programs or may be likely to suffer illness or injury when taking part in the Programs we offer on our Website. If you are in any doubt whatsoever about your ability to take part in the Programs we offer on our Website, you should seek appropriate medical advice from a suitably qualified health professional. Any information on our Website should not be considered a substitute for consultation with a suitably qualified health professional. 8.3 By using our Website and agreeing to these Terms, you agree that you have sought the professional advice of a suitably qualified health professional and that they have agreed that you are able to participate in our Programs. 8.4 By using our Website and Program, it is your responsibility to ensure that the area that you exercise in is safe and that you stop exercising immediately if you notice any detrimental physical effects. You confirm that in this case, you will seek the advice of a suitably qualified health professional and you agree that you will not continue to use any of our Programs unless that health care professional has advised you that you are fit and able to do so. 8.5 You agree to indemnify us and keep us indemnified from and against any and all losses, damages, liability, claims resulting in any way from your use of our Website or your participation in our Programs, your use of any of our products / services or resulting from any other breach of this Agreement by you whether directly or indirectly. 9.1 We will be responsible for any foreseeable loss or damage that you may suffer as a result of our breach of these Terms or as a result of our negligence. Loss or damage is foreseeable if it is an obvious consequence of our breach or negligence or if it is contemplated by you and us when the contract is created. We will not be responsible for any loss or damage that is not foreseeable. Our maximum aggregate liability for breach of these Terms (including any liability for the acts or omissions of its employees, agents or subcontractors) whether arising in contract, tort (including negligence), misrepresentation or otherwise shall in no circumstances exceed the price that you have paid to us, unless there is malice aforethought or gross negligence on the part of us. In any case, we shall only be obliged to compensate for personal and direct damage to you for which we are liable. We only supply goods/services for domestic and private use by consumers. We make no warranty or representation that the Programs are fit for commercial, business or industrial use of any kind (including resale). We will not be liable to you for any loss of profit, loss of business, interruption to business, or for any loss of business opportunity. Nothing in these Terms seeks to limit or exclude our liability for death or personal injury caused by our negligence (including that of our employees, agents or sub-contractors); or for fraud or fraudulent misrepresentation. Nothing in these Terms seeks to exclude or limit your legal rights as a consumer. For more details of your legal rights, please refer to your local Citizens Advice Bureau or Trading Standards Office. 10.1 We may change and update our Website from time to time to reflect changes in our products, services, user needs or business priorities. 11.1 Access to our Website is temporary and we reserve the right to withdraw or amend access at our discretion. 11.2 There may be occasions when our Website, or any content on it, will not be available or maybe interrupted. We may suspend, withdraw or restrict the availability of all or any part of our Website for business and operational reasons. We will always try to give you reasonable notice of any suspension or withdrawal. 11.3 You are also responsible for ensuring that anybody else who accesses our Website through the internet connection is made aware of these Terms and any other such applicable terms and conditions, and ensuring that they comply with these. 11.4 Our Website is directed to people residing in the United Kingdom. We do not represent that content available on or through our Website is appropriate for use or available in other locations. 12.1 We are the owner or the licensee of all Intellectual Property Rights in our Website, and in the material published on it. Those works are protected by copyright laws and treaties around the world. All such rights are reserved. 12.2 You must not use any part of the content on our Website for commercial purposes. 12.3 If you print off, copy or download any part of our Website in breach of these Terms, your right to use our Website will cease immediately and you must, at our option, return or destroy any copies of the materials you have made. 12.4 Our status (and that of any identified contributors) as the authors of content on our Website must always be acknowledged. 12.5 You must not use any part of the content on our Website for commercial purposes without obtaining a licence to do so from us. 13.1 The content on our Website is provided for general information only. It is not intended to amount to advice on which you should rely. You must obtain professional or specialist advice before taking, or refraining from, any action on the basis of the content on our Website. 13.2 Although we make reasonable efforts to update the information on our Website, we make no representations, warranties or guarantees, whether express or implied, that the content on our Website is accurate, complete or up to date. 14.1 Where our Website contains links to other sites and resources provided by third parties, these links are provided for your information only. Such links should not be interpreted as approval by us of those linked websites or information you may obtain from them. 14.2 We wish to make it clear that we have no control over the content of those sites or resources. 15.1 We do not guarantee that our Website will be secure or free from bugs or viruses. 15.2 You are responsible for configuring your information technology, computer programmes and platform to access our Website. You should use your own virus protection software. 15.3 You must not misuse our Website by knowingly introducing viruses, trojans, worms, logic bombs or other material that is malicious or technologically harmful. You must not attempt to gain unauthorised access to our Website, the server on which our Website is stored or any server, computer or database connected to our Website. You must not attack our Website via a denial-of-service attack or a distributed denial-of service attack. By breaching this provision, you would commit a criminal offence under the Computer Misuse Act 1990. We will report any such breach to the relevant law enforcement authorities and we will co-operate with those authorities by disclosing your identity to them. In the event of such a breach, your right to use our Website will cease immediately. 16.1 If you choose, or you are provided with, a user identification code, password or any other piece of information as part of our security procedures, you must treat such information as confidential. You must not disclose it to any third party. 16.3 If you know or suspect that anyone other than you knows your user identification code or password, you must promptly notify us using the contact details above. 17.1 We will not be liable for any failure or delay in performing our obligations where that failure or delay results from any cause that is beyond our reasonable control. Such causes include, but are not limited to: power failure, internet service provider failure, industrial action by third parties, civil unrest, fire, explosion, flood, storms, earthquakes, subsidence, acts of terrorism, acts of war, governmental action, epidemic or other natural disaster, or any other event that is beyond our reasonable control. 18.4 Our Website must not be framed on any other site, nor may you create a link to any part of our Website other than the home page. 19.1 These Terms constitute the entire agreement between you and us regarding your use of our Website and our Programs. In case of any conflict, then these Terms shall prevail over the other terms and agreements referred to above, unless expressly stated otherwise. These Terms are applicable with the explicit exclusion of any other general, supplementary or special conditions that you as a Customer propose with use. This is irrespective of the way in which these other conditions are communicated to us without us being able to tacitly accept them or have any obligation to dispute their application. 20.1 You may not transfer your rights or obligations under this Agreement but we may transfer our rights under this Agreement to someone else. 20.2 Nobody else has any rights under this Agreement. This Agreement is between you and us. 20.3 The invalidity of one or more of the provisions of the Agreement between the parties does not affect the validity of the remaining provisions. In the event that a provision should be invalid, the parties shall replace it by a new provision that adheres as closely as possible to the objectives of the original provision. 20.4 Even if we delay in enforcing this Agreement, we can still enforce it later. If we do not insist immediately that you do anything you are required to do under these Terms, or if we delay in taking steps against you in respect of your breaking this Agreement, that will not mean that you do not have to do those things and it will not prevent us taking steps against you at a later date. 20.5 The abstinence from, or failure to, exercise or enforce its rights by one party with respect to the other party will under no circumstances constitute a waiver thereof, unless such a waiver is in writing and signed by the waiving party. No waiver shall be deemed to be a waiver of any subsequent breach nor any breach of any other provision. 20.6 Which laws apply to this contract and where you may bring legal proceedings. These terms are governed by English law and you can bring legal proceedings in respect of the Programs in the English courts. If you live in Scotland you can bring legal proceedings in respect of the Programs in either the Scottish or the English courts. If you live in Northern Ireland you can bring legal proceedings in respect of the Programs in either the Northern Irish or the English courts.